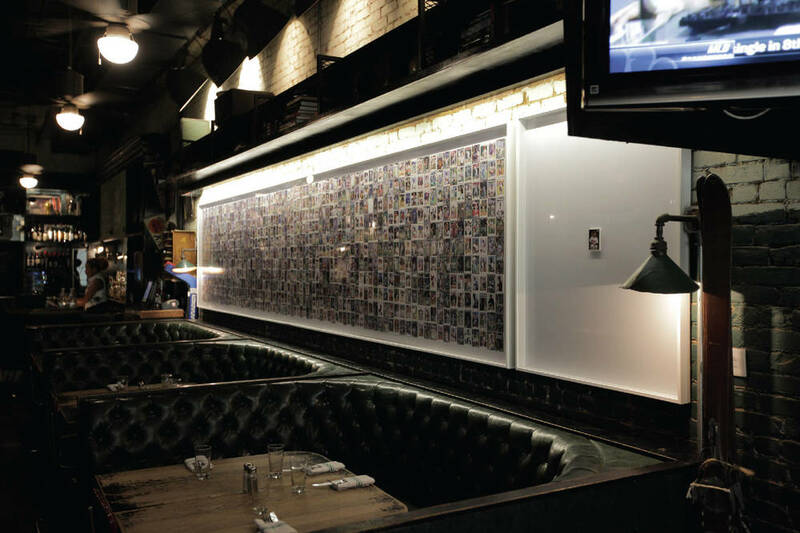 Warren 77 is a bar and restaurant in Tribeca, co-owned by Matt Abramcyk (Beatrice Inn, Navy) and Sean Avery (New York Rangers) that pays tribute to the legendary players and teams of New York. An 18-foot installation of framed baseball cards, showing the improbability of becoming one of the greats. For every thousand nobodys, there is just one Derek Jeter (#2). All cards are from his draft year, 1993. Above the bar sits a vintage television that plays live sports with a vintage look. But with some hacking and surprise, when it goes to commercial it plays classic ads featuring New York sports greats. Click play on the TV to watch.